You remove the four Jacks. A Card is selected and returned to the deck. The deck is cut into two halves - one remains on the table. The four Jacks are placed face up on the table half and cut into the middle. One by one the Jacks leave the tabled half and appear face up in the half in your hands. However, the fourth Jack refuses to travel. But you realise what has happened. You spread the tabled half and the Jack is still there, face up. The card immediately above it proves to be the selection. You give a spectator an Ace, Two, and Three of any suit, while you hold the two black Jacks. In an instant, the two packets change places..
A rapid-fire elevator routine where an Ace, Two, Three magically penetrate two black Jacks, then do so once more at a blistering pace. The effect is Alex Elmsley's "Diamond Cut Diamond". The feature of this version is that the spectator can deal the Diamonds and there is no Palm or Second Deal. This routine was sent to me by Gene Maze back in 1995. It was part of a wonderful correspondence we had going at the time. You remove four cards from your pocket and place them face down on the table, stating that these are an infallible prediction. A spectator freely chooses a card from your deck - it can be signed. - and then it is lost back into the deck. The spectator is given the four prediction cards. You tell him to transfer the top card to the bottom, after which you point to the top card, saying, "That's not your card." When this card is dealt face up, it proves to a blank faced card with the words NOT YOUR CARD printed on its face. This is repeated two more times, and each time the card turned has NOT YOUR CARD printed on it. "What was your card?" you ask. The last card proves to be the spectator's selection. You can end right here, or you can add an extra effect. After a pause, you continue, saying, "What if the trick had gone wrong?" You pick up the three word cards and insert the selection among them. Now you count the cards, one by one, and all four cards now say, NOT YOUR CARD. You continue, saying, "In fact, I don't know why this trick DID NOT go wrong ... because your signed card has been in my pocket all along!" At that, you reach into your pocket and bring out the selected card. Duffie examines Dr. Daley's last trick, with a little help from Fred Robinson. The following is a solution to a card problem which was posed in issue 7 of Profile magazine. The principle used comes from Roy Walton's Helensburgh Speller where Roy credits Stewart James with the concept. I like the Lie Detector plot. Martin Gardner was first to introduce the lie/speller aspect. I have published several methods over the years. Here is another one! 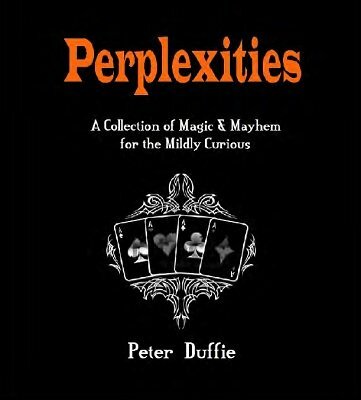 Its been a long time since I've read a Duffie book, I jumped in and purchased his latest offering Perplexities as soon as I received the email from Lybrary.com's Chris. I review products based on the ad copy. You may read an effect there and compare it with my notes. Lets break it down. Automatic Aces: Cool procedure where the spectator finds the 4 aces. Although a bit discrepant its extraordinarily straight forward. Negatives include a tricky preparation, and while you could open with this, its likely whatever other setups you planned ahead will get destroyed as the spectator is undergoing the procedure. Rideckulous: If you thought the ad description is odd its because its wrong. The "helpers" ( i.e 2 black Jacks ) sandwich the selection as well as all the cards of the OPPOSITE colour. The direct method allows for a very straightforward trick without any procedure, which is unusual as the whole thing is totally hands off. The price is a setup that you can prepare on the fly at an opportune moment if you can cull your way to a red-black separation. Natterjacks: The ad is very accurate. From a shuffled deck in use, 3 jacks jump from a spectator's half to yours. The last jack doesn't jump, but rather locates a spectator's selection. The method is very simple yet allows for a very direct effect. I personally find the finale of finding a selection is out of place and may work to change it, though thats a personal choice. Hellish Prequel: Hellraiser is one of Peter Duffie's more known tricks and this one is intended to be used as a lead in to it. 2 Jacks transpose with 3 cards. One phase, direct method, no extra cards and the deck never in sight. Its a bit discrepant though I believe it'll fly. I use a Marlo version of the Glide and its perfect for this. Hell Raiser 1-2-3: The original Hellraiser is one of the most direct Elevator routines and this update has made it even more direct. Accurate ad description. No extra cards and no deck is needed. If you enjoy the Elevator plot you'll be hard-pressed to find a more direct method. While I'm not sure I'll use a transposition ( the previous effect ) to lead to an Elevator, that is my personal choice however I would've preferred to read how Mr.Duffie segues to it. Missing Diamonds: The ad copy is accurate however since its lacking I'll provide some needed background. In the original Alex Elmsley's Diamond Cut Diamond, you openly remove the Ace thru 10 of diamonds and later change any one of them to the selection. It gave the spectator a tremendous amount of freedom rarely captured in other versions but there was a price: It heavily depended on false deals. Alot of variations attempted to address this including many by Peter Duffie himself. Here, the crux of Duffie's idea is allowing the spectator to deal and change the card herself. Its a straightforward method and I believe its a genuine improvement on the original. In my personal view, if the selection is modified somehow as a thought of card, it would provide an extremely eerie feeling to the spectator. Can be done from a shuffled deck. On a side note, as openly arranging the diamond cards is a big dead-time in performance I would produce them magically at the outset. A Dani DaOrtiz effect is great for this though its name escapes me. Triple Stop by Gene Maze: You and the spectator deal down cards and you both stop at the mates. This is done 3 times. Extremely direct though uses very technical sleights. If you do Jack Merlin's Lost Aces this will immediately go to your repertoire. Not Your Card: Accurate ad description. I typically despise down-under deals but I love it here as it allows for comedy. Carry the needed "Not Your Card!" in your pocketwallet and you're always ready on the go. Instant reset, zero setups in the deck. I personally think its stunning, comical and very practical. To get the finale you need to palm a card from a small packet which can be tricky. I personally would use Ed Marlo's Future Classic Palm or a Lewy Palm ( Expert Card Technique ). Obviously seasoned magicians can see many additional endings for this ( to wallet, folded card to anywhere .. etc ). Since you're making the comical cards from normal blank cards, you can customize them to any lines or messages you deem fit particularly in a company show. Too Secret: Vague ad description. You're locating 2 seemingly thought of cards using a procedure that is ( in my opinion ) poorly justified. Even if you do justify it, I personally believe its too procedure heavy to be used for laymen. From a borrowed shuffled deck, so you may enjoy performing it for fellow magicians. Last Orders: A way to perform Dr.Daley's Last Trick. No routine, just a single phase. I'm not sure how original this is as its virtually identical to Bill Malone's handling of the trick in his On The Loose DVDs with the exception of a handling touch that makes a sleight smoother to get into. Its a nice touch, a good one, but that's it. I Me Mind: The spectator spells to the mate of his freely thought of card. No procedure except the actual spelling. The effect is short and to the point but with a big price: A big 29-card-setup is needed. Lying Low: You spell out the spectator's answers to your questions and the deck always reveals the true answer whether the spectator answers truthfully or not. You end up producing the other 3 mates, allowing you to deduce selection. 20-card-setup is needed and I don't see a way to easily arrive to this. Personally I don't see how the setup is worth the amount of magic you're getting though readers' taste may vary, especially Karl Fulve's fans. Overall lots of good material here to cover the price. I tried to elaborate on the ad copy and to mention the negatives when I see them. I like how Peter Duffie's latest work are less focused procedures and more about direct effects. I hope this review was helpful.